Confirm authenticity of your restorations. 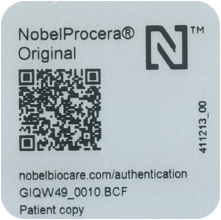 Use the authentication tool to verify that you have purchased genuine NobelProcera products. The authentication tool checks your product's filename against our records and then tells you whether you have a genuine NobelProcera product. You can check every NobelProcera product manufactured within the last 12 months. Just enter the filename below and press the "verify" button.